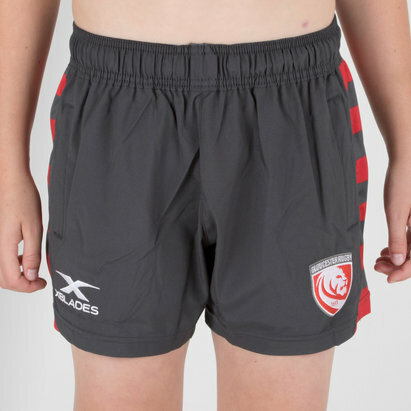 Display your loyalty to the club when in the gym, on the training field or at the Kingsholm Stadium with the Gloucester 2018/19 Kids Home Rugby Shorts from X Blades. These official home rugby shorts of Gallagher Premiership team, Gloucester Rugby, comes in a grey and red design that represents the clubs traditional colours to match those of the home shirt. Made from 100% polyester material, X Blades shorts have moisture management to help you keep cool when necessary or warm when it's required. The breathable construction of these shorts makes these the perfect short to be running around in without irritation along with their high UV protection to keep your skin protected from those strong rays that catch us off-guard. Stay cool and refreshed when you work out and fine-tune your skills on the practice pitch without ever compromising your support for Gloucester Rugby with these Gloucester 2018/19 Home Rugby Shorts.